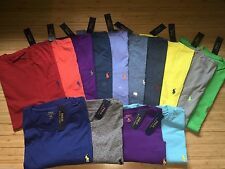 5 out of 5 stars - NEW Men Polo Ralph Lauren Crew Neck T Shirt Size S M L XL XXL - STANDARD FIT. 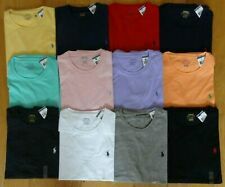 7 product ratings7 product ratings - NEW Men Polo Ralph Lauren Crew Neck T Shirt Size S M L XL XXL - STANDARD FIT. Armpit to armpit - 26". Hi for sale is the item pictured above. 27.5” long top to bottom mid shoulder. 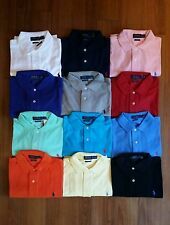 Polo Ralph Lauren Button Down Size: 4XB Shirt is in Great Condition, 30 day returns if you are not fully satisfied. Contact me with any questions! Shoulder to shoulder : 20 1/2". Sleeve : 10 1/2". Embroidered pony logo on left chest, 2-button placket, ribbed collar and armbands, longer tail in back. Shirt is Heather Gray and is in very good condition with no holes or stains. 100% Authentic. 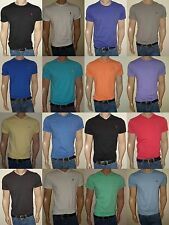 Polo Jeans Company Clothing for men comes in a variety of styles, garments, and tastes. Since the brand makes a variety of cuts, colors, and fits, there's something for almost everyone. Different styles are crafted from a range of textiles that are appropriate for both casual and formal affairs. 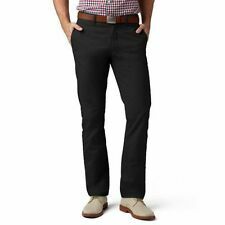 What are some types of Polo Jeans Company men's clothing? The Paneled Merino Wool Sweater is made from a quilted tartan and merino blend. The sweater features a zip-front closure and lots of extra insulation for keeping warm during cool weather. The sleeves are navy while the tartan pattern is in a mixture of green, blue, and black. The Washable Cashmere Sweater is available in four different shades of blue and neutral. A crew neck, ribbed cuffs, and ribbed hem keep heat inside and cold out. Breathability and softness are first and foremost, and this sweater can be paired with any sort of bottoms to tailor your look to the specific occasions. The Polo Ralph Lauren Corduroy Suit Trouser comes in black. The fabric is a wool-corduroy blend, giving it a soft, vintage flair. Two front angled pockets, a spot for coins, and two back pockets mean plenty of storage for essentials and odds and ends. Pants are unlined and include an extended hook and bar closure. How do you clean Polo Jeans Co apparel? Proper cleaning and caring for Polo Jeans Company apparel will depend on which materials are utilized in the particular garment. Wool and cashmere apparel is generally dry clean only in order to avoid shrinking. Other garments like flannel, cotton, and linen can be machine washed on a cool, gentle cycle. Consider hanging garments to dry rather than machine drying to avoid any damage or distortion of fabrics. What materials are used to make Polo Jeans Co apparel? The Polo Ralph Lauren Jeans Company uses a variety of textiles to make apparel. Linen, cotton, polyester, synthetic blends, elastane, cashmere, flannel, silk, mesh, and corduroy are some of the materials utilized. The material that a garment is made from largely determines whether it is more appropriate for casual or formal dress and events. What are some Polo Ralph Lauren Jeans Co apparel trademarks? Polo jeans clothing often features a logo of a polo player on a horse. 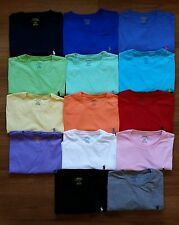 The signature polo shirt has the logo sewn in varying sizes and contrasting colors while other, more formal pieces like the cashmere sweater may have the logo on a tag or in a more discrete location. Polo is also associated with classic, timeless styles and clean lines in clothing silhouettes.